Expect the highest level of customer service from Sea Hawk. 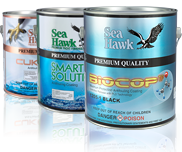 Sea Hawk pledges to serve our customers with fairness, sincerity, courtesy, respect and appreciation, delivered with unmatched responsiveness, expertise, efficiency and accuracy. Our American Made and owned family business was built by creating long-lasting relationships, and we treat our customers like they want to be treated. We provide premium service and products, delivered by a dedicated task force that takes 100% responsibility for exceeding customer expectations.